Remember the Paris Agreement? It was sealed on 12 December 2015, when nations triumphantly pledged to strengthen the global response to the threat of climate change, by "holding the increase in the global average temperature to well below 2°C above pre-industrial levels and pursuing efforts to limit the temperature increase to 1.5°C above pre-industrial levels, recognizing that this would significantly reduce the risks and impacts of climate change." 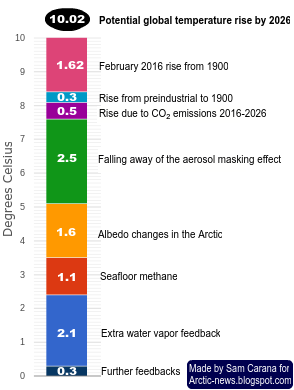 Months before the Paris Agreement was sealed, temperatures had already risen to more than 1.5°C above pre-industrial levels. Meanwhile, temperatures have been above the 1.5°C guardrail for most of the year 2016, i.e. for seven out of eleven months and this may well become eight out of twelve months once the full data for December 2016 is available. It was more than 1.5°C (2.7°F) warmer than pre-industrial for 10 out of the 14 months from October 2015 to November 2016. The situation is dire. Little or no action is taken on climate change. Earth faces a potential temperature rise of more than 10°C or 18°F by 2026. The situation in the Arctic is critical. While Earth as a whole is experiencing rapid warming, warming in the Arctic is escalating even faster and this rise is accelerating, due to feedbacks such as snow and ice demise and destabilizing sediments at seafloor of the Arctic Ocean. These sediments contain huge amounts of methane in the form of hydrates and free gas. 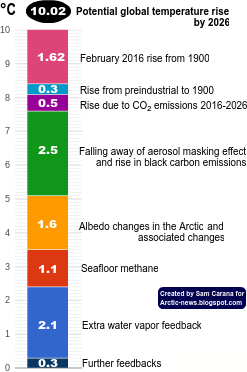 Albedo changes associated with decline of Arctic sea ice and snow and ice cover on land in the Arctic could lead to a 1.6°C warming, while methane eruptions from the seafloor could well cause an additional 1.1°C temperature rise over the next decade. This temperature rise will trigger further feedbacks such as a rise of water vapor in the atmosphere. Water vapor is a potent greenhouse gas that will further accelerate the temperature rise. 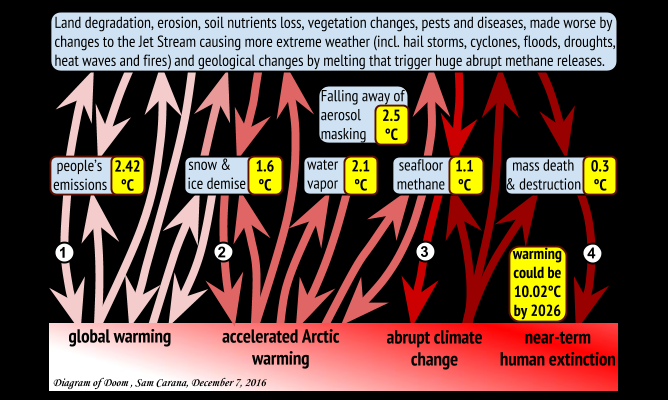 In combination with further elements, the danger adds up to a potential global temperature rise of 10°C or 18°F by 2026. The danger is described in more detail at the Extinction page. Below are further images illustrating the danger. 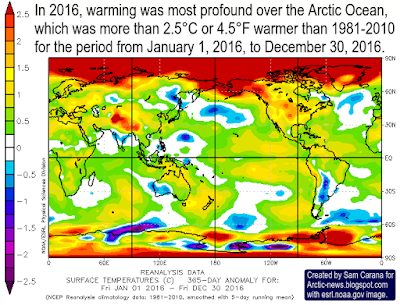 Over the entire year 2016, warming was most profound over the Arctic Ocean, which was more than 2.5°C or 4.5°F warmer than 1981-2010, as illustrated by the image on the right. 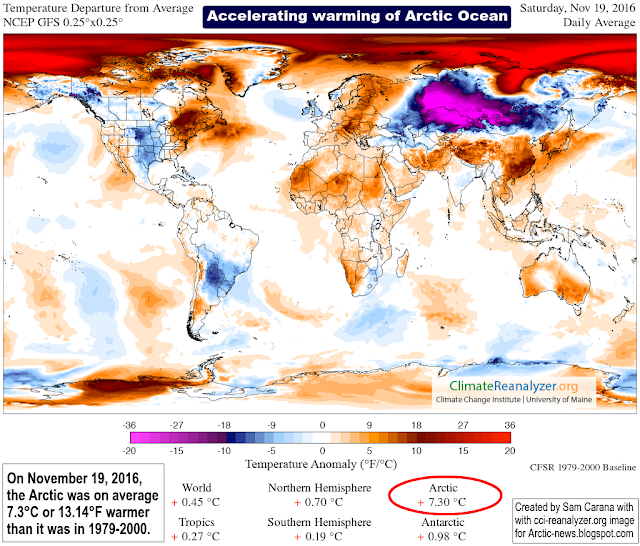 The Arctic is hit particularly hard by warming. Warming of the air over the Arctic Ocean is taking place much faster than elsewhere on Earth, as illustrated by the animation underneath on the right. This animation shows how this anomaly developed over the past few years, each time showing a 365-day period, starting in 2014 and each time shifted by roughly one month. 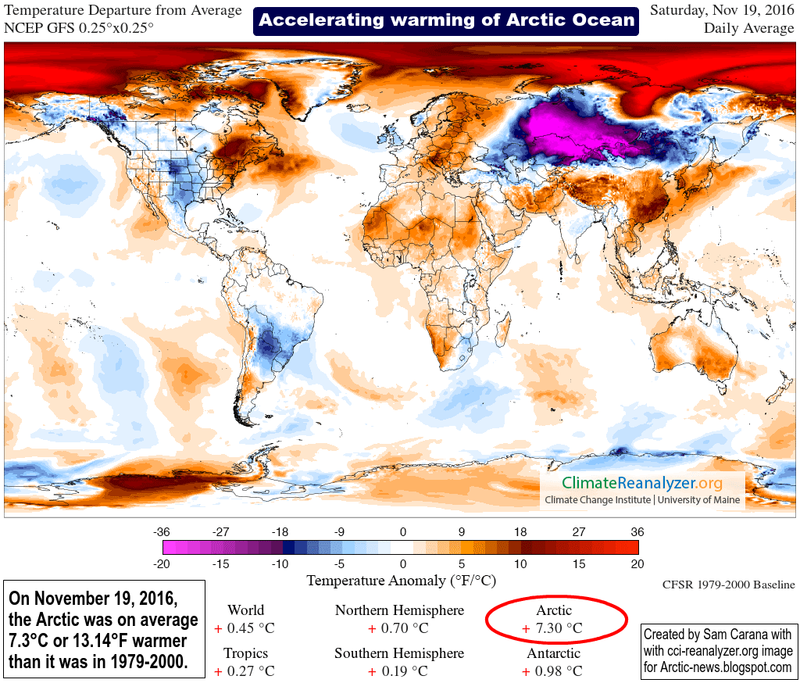 On November 19, 2016, the Arctic was 7.3°C or 13.14°F warmer than it was in 1979-2000, as the image below shows. On that day, the Arctic Ocean in many places showed temperature anomalies at the top end of the scale, i.e. 20°C or 36°F warmer than it was in 1979-2000. 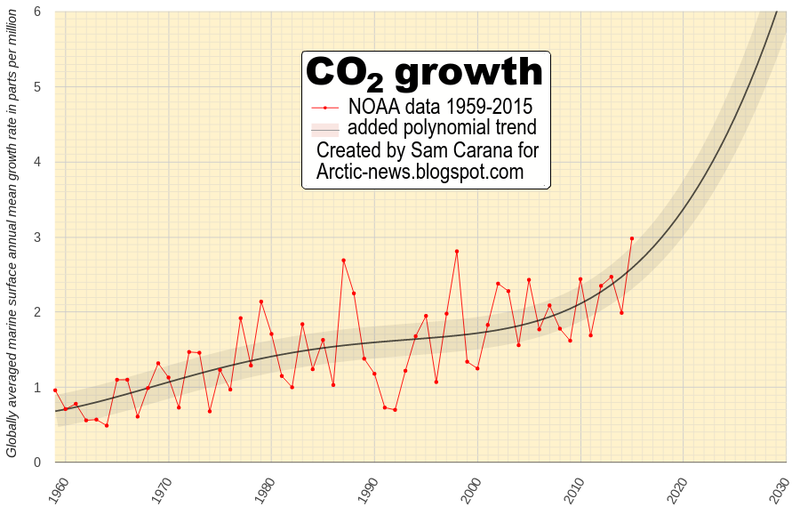 From the post Accelerating Warming of the Arctic Ocean. These high temperatures over the Arctic Ocean reflect warm water of the Arctic Ocean, with heat added from the Atlantic Ocean and the Pacific Ocean. The image below shows the warming of the oceans. Temperatures are rising particularly rapidly on the Northern Hemisphere. The huge amounts of energy entering the oceans translate into higher temperatures of the water and of the air over the water, as well as higher waves and stronger winds. The North Atlantic Ocean is warming up rapidly and much ocean heat is carried by the Coriolis force along the Gulf Stream from the coast of North America through the North Atlantic into the Arctic Ocean. The image below, from an earlier post, shows sea surface temperature anomalies on August 12, 2016, in the left-hand panel, and sea surface temperature anomalies in the right-hand panel. Above image also shows that on August 12, 2016, sea surface temperatures near Svalbard (at the location marked by the green circle) were as high as 18.9°C or 65.9°F, an anomaly of 13.6°C or 24.4°F. 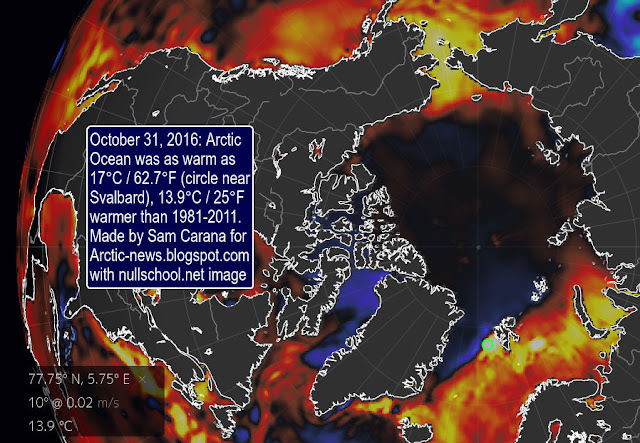 Above image shows on October 31, 2016, sea surface temperatures near Svalbard (at the location marked by the green circle) were as high as 17°C or 62.7°F, an anomaly of 13.9°C or 25°F. 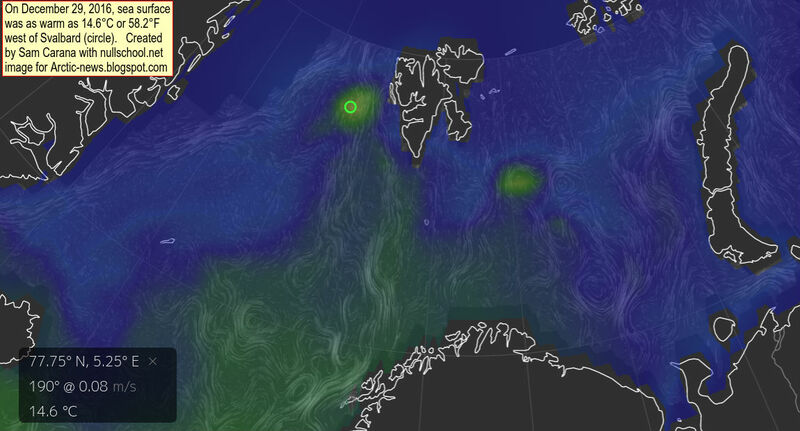 The image on the right shows that sea surface temperatures near Svalbard (green circle) were as high as 14.1°C or 57.3°F on December 6, 2016, 12.1°C or 21.7°F warmer than in 1981-2011. This rise in ocean heat contributes strongly to the demise of Arctic snow and ice cover, and threatens to trigger ever larger eruptions of methane from the seafloor of the Arctic Ocean. Over the past few years, trends have been pointing at zero thickness soon, i.e. in a matter of years. Rapid loss of sea ice thickness has taken place over the years, as discussed in a recent post. 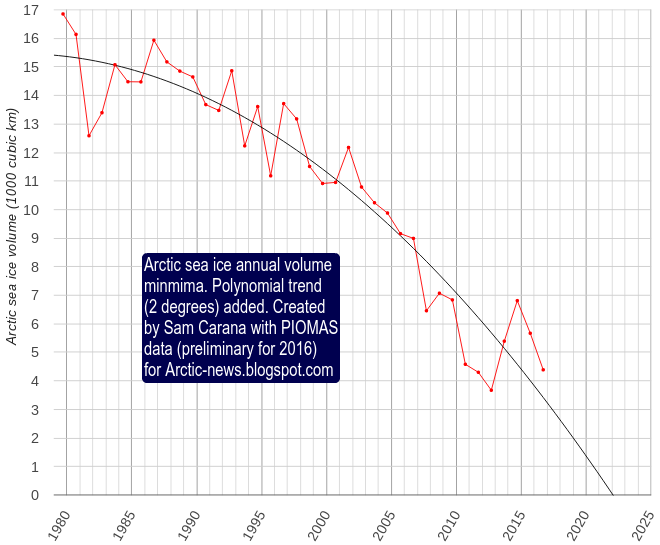 A trend based on PIOMAS volume data (preliminary for 2016) points at zero sea ice by end 2021, as illustrated by the graph below. Collapse of the sea ice could well occur much earlier than the trend indicates. Thin sea ice is more vulnerable to the stronger storms that can be expected to hit the Arctic Ocean during the northern summer more frequently, and they could push huge amounts of ice out of the Arctic Ocean. The sea ice also acts as a heat buffer, by absorbing energy in the process of melting. In other words, as long as there is sea ice, it will absorb heat and this will prevent this heat from raising the temperature of the water in the Arctic. 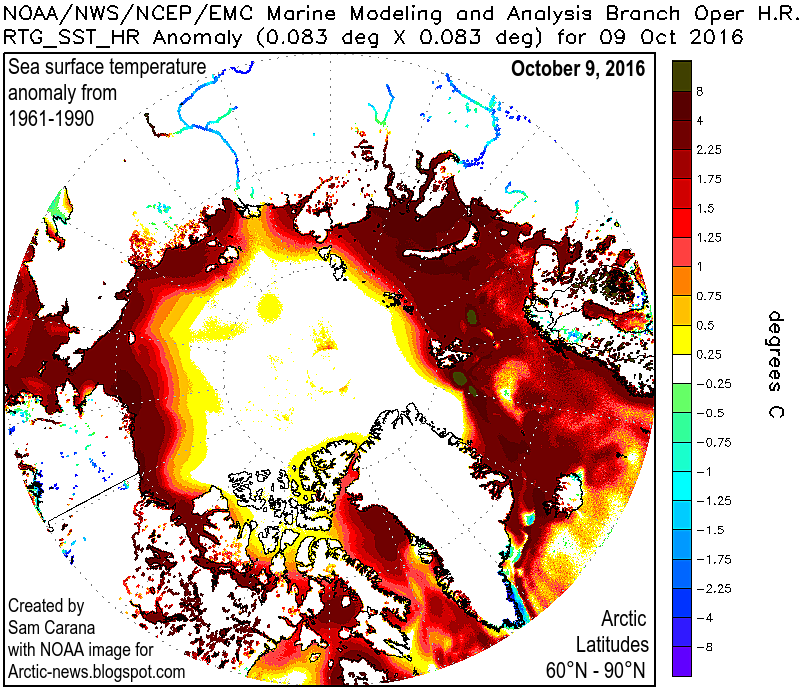 Once the sea ice is gone, this latent heat must go elsewhere. 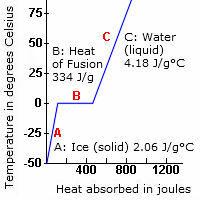 The amount of energy absorbed by melting ice is as much as it takes to heat an equivalent mass of water from zero to 80°C. Arctic sea ice volume has now decreased so much that this buffer is now largely gone and that a lot more heat will be absorbed by the Arctic. Sea ice acted as a buffer that used to consume massive amounts of ocean heat carried along sea currents into the Arctic Ocean. A huge amount of energy used to be absorbed by this buffer, i.e. by melting ice and transforming it into water. The energy that used to be absorbed by melting ice is as much as it takes to warm up an equivalent mass of water from zero°C to 80°C. Without sea ice to consume heat, the heat must go somewhere else. 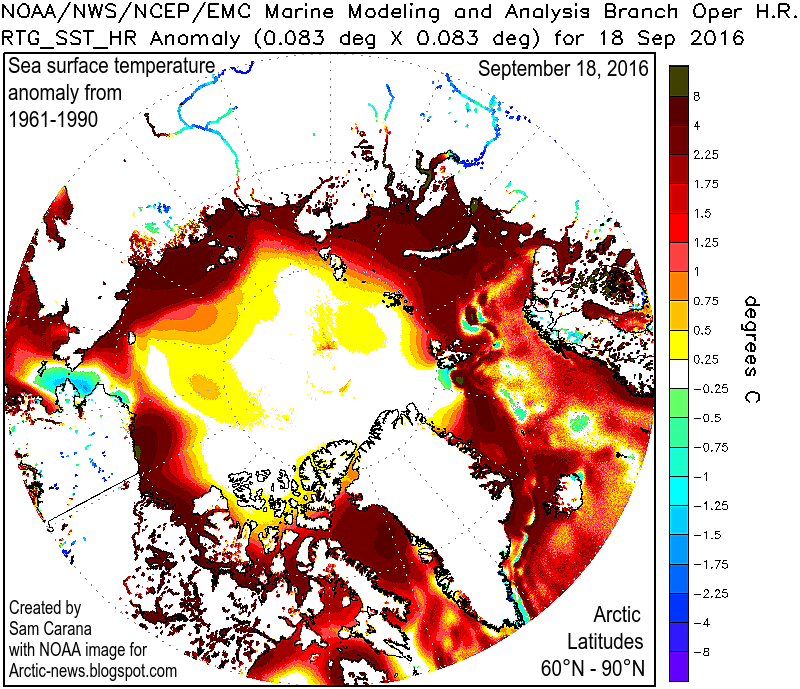 Much of this heat will then suddenly speed up warming of the water of the Arctic Ocean, rather than going into melting the ice as it did previously. 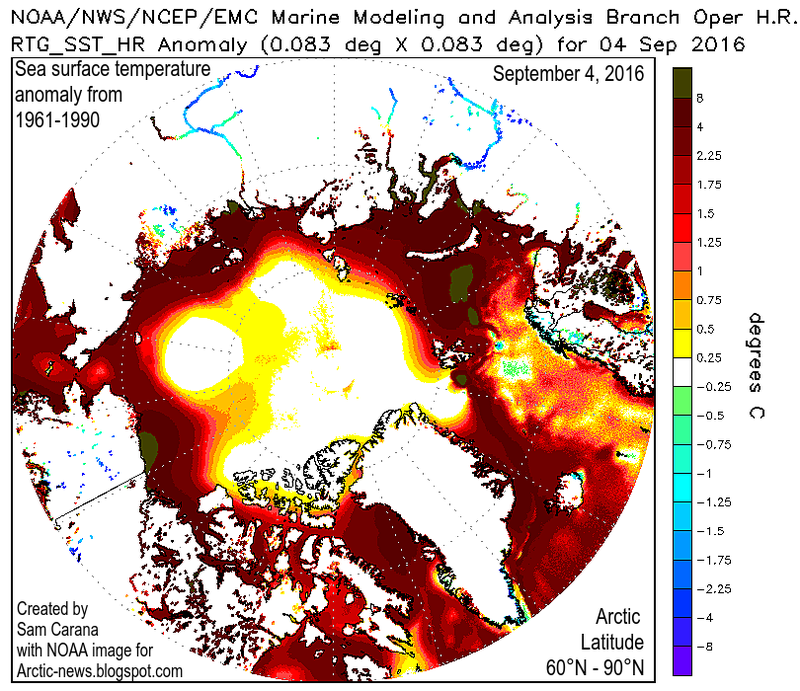 So, the water of the Arctic Ocean will suddenly warm up dramatically. Remember that the Arctic Ocean in many areas is very shallow, in many places it's less than 50 m deep, as discussed in an earlier post. Disappearance of the sea ice would mean that the buffer has gone, further increasing the danger of huge abrupt releases of methane from the seafloor of the Arctic Ocean. The danger is that this extra heat will reach the seafloor and destabilize methane hydrates that are contained in sediments at the bottom of the Arctic Ocean. This could result in huge methane eruptions. It is hard for methane plumes to get broken down in the water, given the abrupt and concentrated nature of such releases and given that the Arctic Ocean is in so many places very shallow. Once that methane enters the atmosphere, it will strongly contribute to further warming of the atmosphere over the Arctic. As the water of the Arctic Ocean keeps warming, the danger increases that methane hydrates at the bottom of the Arctic Ocean will destabilize. As said, increases in temperature due to albedo changes and methane releases in the Arctic will go hand in hand with further feedbacks, including increased levels of water vapor in the atmosphere, warmer river water running into the Arctic Ocean and more soot from wildfires that will settle on the remaining sea ice. Above image shows sea surface temperature anomalies in the Arctic (latitude 60°N-90°N) on October 9, 2016, compared to 1961-1990. Above image shows sea surface temperature anomalies in the Arctic (latitude 60°N-90°N) on September 18, 2016, compared to 1961-1990. 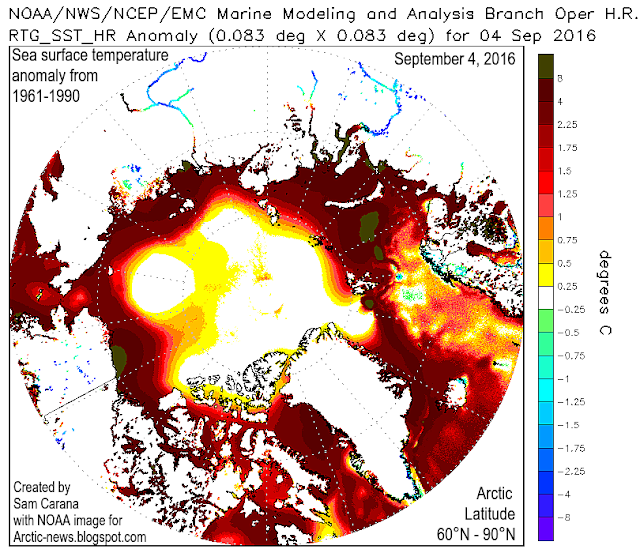 Above image shows sea surface temperature anomalies in the Arctic (latitude 60°N-90°N) on September 4, 2016, compared to 1961-1990. 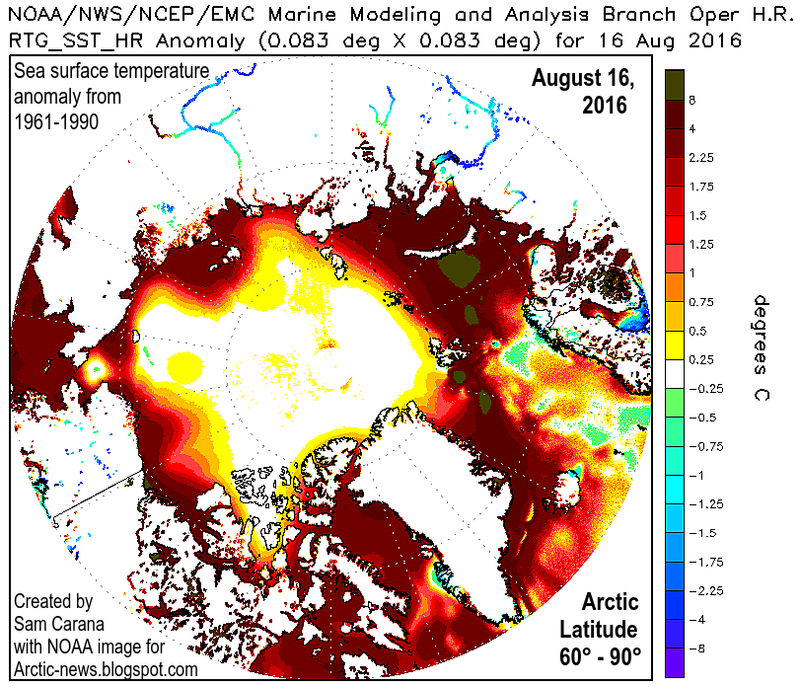 Above image shows sea surface temperature anomalies in the Arctic (latitude 60°N-90°N) on August 16, 2016, compared to 1961-1990. 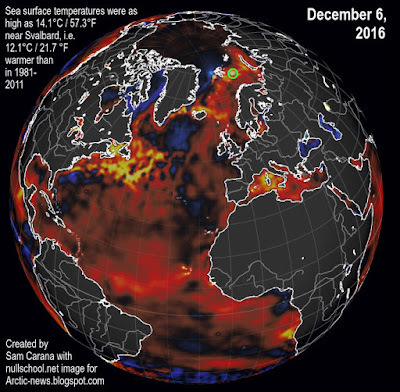 Above image shows sea surface temperature as high as 14.6°C or 58.2°F on December 29, 2016, near Svalbard, as a result of warm water being pushed from the North Atlantic into the Arctic Ocean. 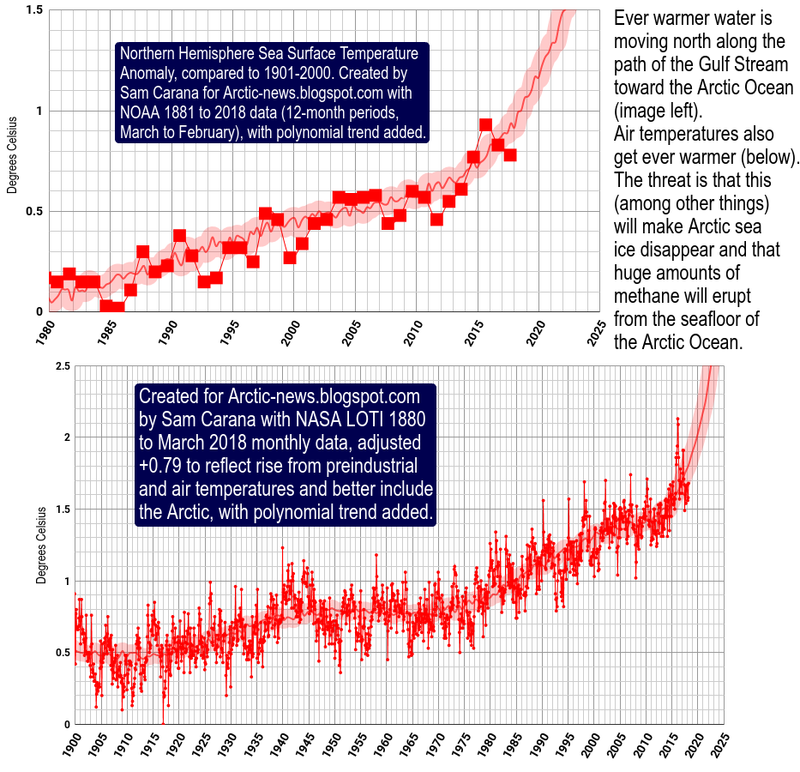 From the post: Accelerating Warming of the Arctic Ocean. 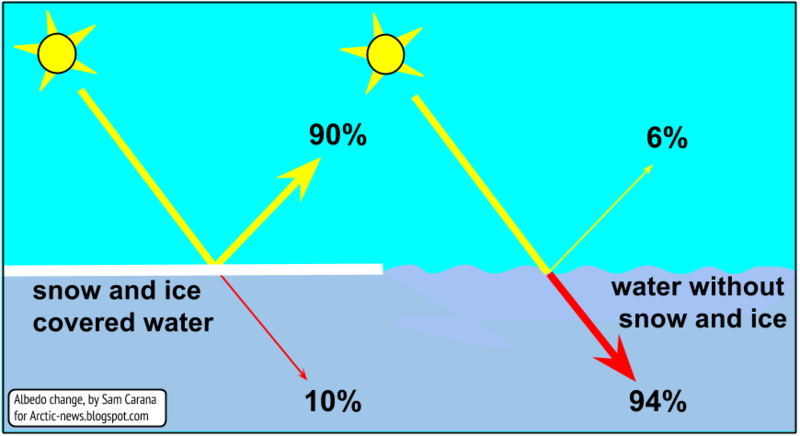 Above image, from an earlier post, illustrates how a cold freshwater lid on the North Atlantic could result from stronger evaporation, in combination with meltwater, causing more heat to get carried into the Arctic Ocean underneath the sea surface, due to reduced heat transfer to the atmosphere from water on its way to the Arctic Ocean. Note that there is a huge lack of monitoring of the situation regarding methane in the Arctic. 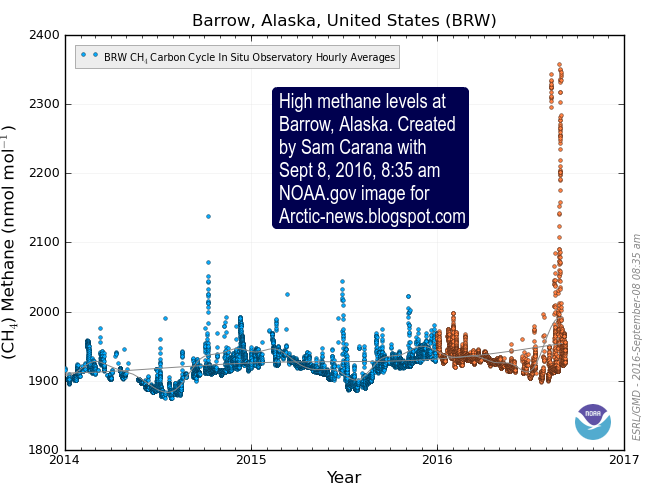 Above image shows high methane levels recorded at Barrow, Alaska, that were later removed by NOAA. While there may be uncertainty, due to limited availability of data, such uncertainty does not make the problem go away. The situation is critical; in many respects, we can just count ourselves lucky that much larger methane eruptions haven't occurred as yet. 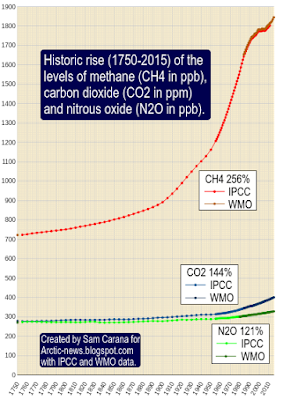 The image on the right shows historic growth rates of methane (CH4), carbon dioxide (CO₂) and nitrous oxide (N2O). 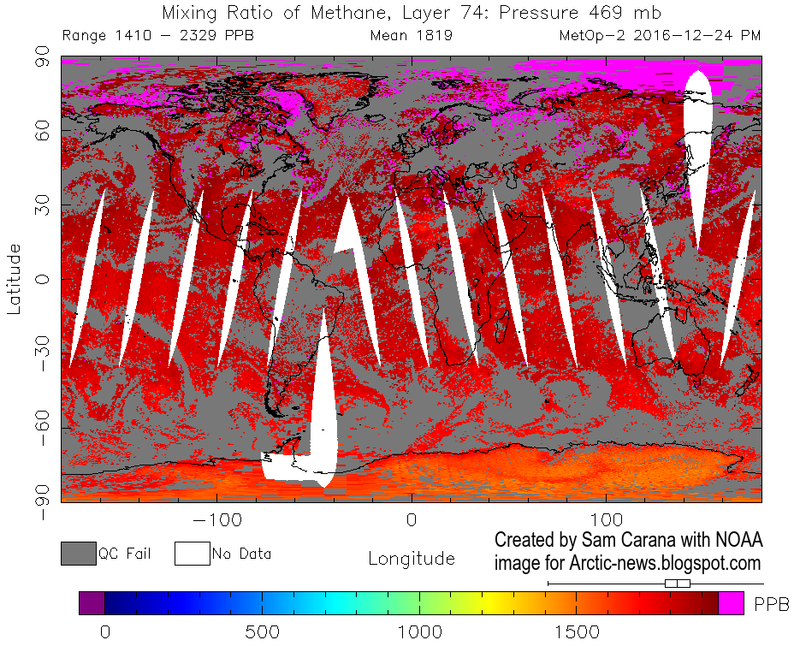 Methane levels increased most (256% of 1750 levels in 2015, red), much more than carbon dioxide (144% of 1750 levels in 2015, blue) or nitrous oxide (121% of 1750 levels in 2015, green). The image below shows the recent situation, with trends pointing at an increase in the methane burden by a third by 2030 and a doubling by 2040. Why again is methane so important? 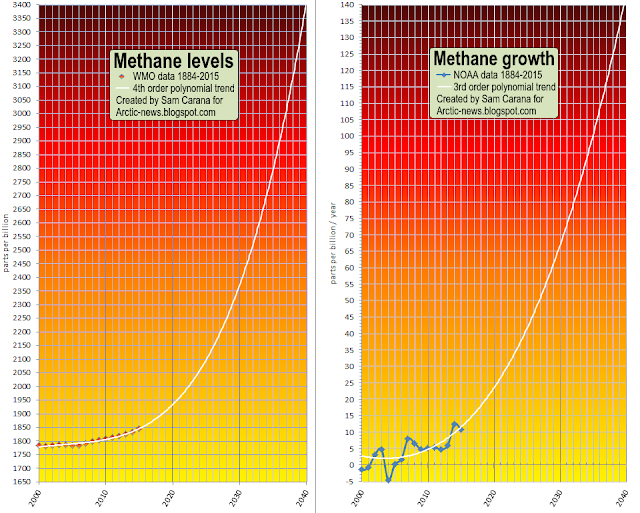 On a 10-year timescale, methane causes more warming than carbon dioxide. 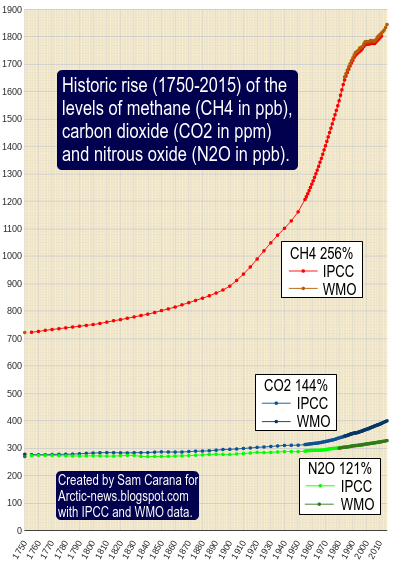 Unlike carbon dioxide, methane's Global Warming Potential rises as more of it is released. Methane's lifetime can be extended to decades, in particular due to depletion of hydroxyl in the atmosphere. Ominously, methane levels were very high over the Laptev Sea (solid magenta color north of Siberia) on November 9, 2016. 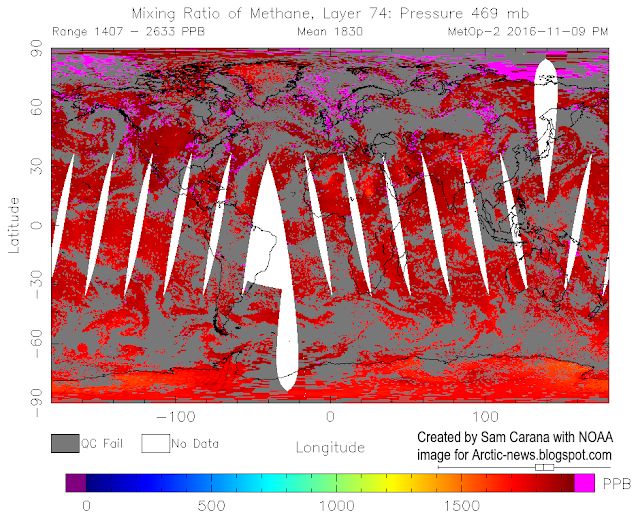 The image below also shows that on November 9, 2016, methane levels were as high as 2633 parts per billion. The danger is further illustrated by the two images above and below, recorded by the MetOp2 satellite on the afternoon of Christmas eve and Christmas. 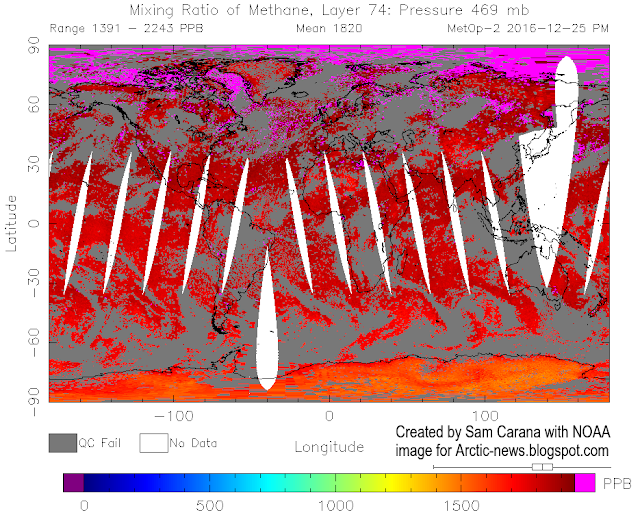 Continued warming could trigger huge abrupt methane eruptions leading to mass destruction and extinction. 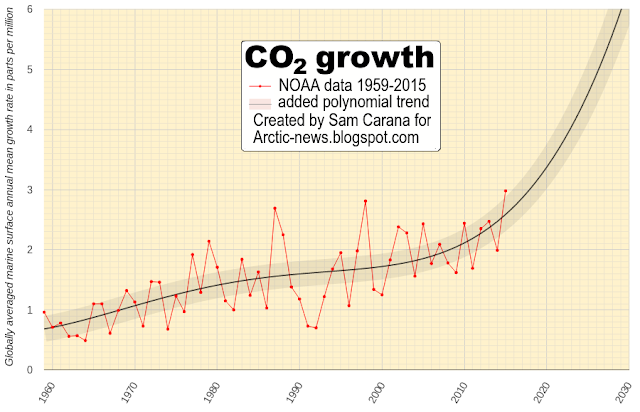 To top it off, the image below shows that growth in CO₂ levels appears to be accelerating. According to NOAA, mean global carbon dioxide grew from 2004-2014 by an average 2.02 ppm per year. For 2015 the growth rate was 2.98 ppm. As an indication for what the 2016 growth rate will be, global CO₂ levels grew by 3.57 ppm between September 2015 and September 2016, and by 3.71 ppm between October 2015 and October 2016. [ Potential temperature rise from preindustrial to 2026. For details see original post and the Temperature page. The final two images show a potential temperature rise from preindustrial to 2026 of 9.7°C (annual average) and 10.02°C (monthly peak), and below a prognosis of the number of climate-related global deaths in line with the action taken. I just tweeted the share link to Donald Trump. Today 12/19/2016 Our electorate college will play a major role in our future. After this day is over'the situation is dire' may very well become the understatement of the last and final century. "SAD!" Won't cut it. It's disheartening when I make an earnest attempt to grasp what's to come. If only, there was some way to use Article 1 Section 9 Clause 8 to influence the electors decision by recognizing both Trump and Clinton are in direct violation and should therefore be disqualified. This would leave one candidate standing with electorate votes. Senator Bernie Sanders. I'm not religious in the least. However, if this were to happen, I just might have to reconsider the fact that there may be a God after all. Hope springs eternal, I suppose. What can I say? That the gains we make of the business today is more important than that we can live tomorrow ? That science lack reason ? Our destiny reminds me of the final words of George Henrik von Wright : Industry and science based technology is continuing its forced marsch through the world dragging confused nationstates toward an unknown destination. Its a marsch like the unhappy Ivan Karamazov after he deliverd his soul to The Evil.